Cheltenham Racecourse announced today that the opening race of The Festival, on Tuesday, March 16, will this year be called the Spinal Research Supreme Novices’ Hurdle. The race is being sponsored by the Stewart family, headed by Andy Stewart, the well-known businessman and owner. One of Andy’s sons, Paul, suffered a severe spinal injury in a snowboarding accident in December, 2008. He was paralysed from the waist down and initially told by doctors that he would never walk again. However, pioneering treatment in the UK and in Miami has seen Paul progress to the stage where he can now get around with only a walking stick. Spinal Research is the UK’s leading charity funding medical research around the world to develop reliable treatments for paralysis caused by a broken back or neck. Every year more than 800 people in the UK and Ireland are paralysed following an injury to their spinal cord. Spinal Research raises money to fund research into clinical treatments as well as vital basic scientific research. Thanks to this work, the treatment of paralysis is improving all the time and some therapies can now, in some cases, help restore movement and feeling, in the process transforming the lives of paralysed people. Commenting on his support of this historic race, Andy Stewart said: “For obvious reasons this is a cause close to my heart, and a high-profile sponsorship seemed a great opportunity to increase awareness of Spinal Research and highlight the great work that it does for victims of spinal injuries. Peter McNeile, Cheltenham’s Director of Sponsorship, added: “It is a typically generous gesture by Andy Stewart and his family to support the Spinal Research Supreme Novices’ Hurdle and give such a boost to an extremely deserving charity. 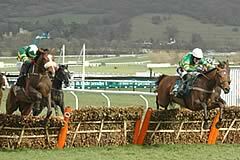 Last season’s Spinal Research Supreme Novices’ Hurdle was won by Go Native, who beat Medermit by a neck. Both horses are now leading fancies for this season’s Smurfit Kappa Champion Hurdle. The Festival 2010 takes place from Tuesday to Friday, March 16 to 19.